Frequent flyers may remember a period when the TSA warned travelers not to take certain smart phones onboard airplanes out of fear that their batteries could catch fire. While the small lithium-ion batteries used in cell phones may cause injury, they are generally not large enough to cause damage to buildings or other structures. When batteries reach utility-scale, however, fires begin to pose a serious risk, one already seen with some electric vehicles. 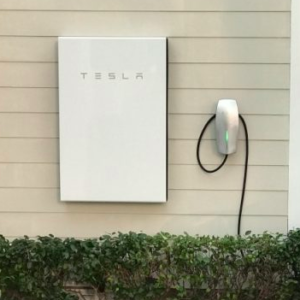 As utilities invest more in the solar+storage model of generation, battery purchases are expected to only continue to grow. This could make for an increased fire risk, however, one that many municipalities are only just beginning to plan for. Lithium-ion batteries store more energy for their size and weight than do other existing technologies and increasingly are used both in consumer electronics and proposed electricity storage facilities. Although they are generally stable, lithium-ion batteries can catch fire if something causes them to overheat. These fires are difficult to fight because of the high heats. Recent fires in Tesla cars are under investigation by the National Transportation Safety Board, and the National Highway Traffic Safety Administration is investigating another incident with an eye towards setting appropriate vehicle safety standards. The batteries used in electric cars are smaller than those proposed for utility-scale installations. Still, it is enough to make some regulators wary. New York City is making one of the first attempts to establish battery safety standards. One of the primary fears is that hot spots could linger in residential battery installations, reigniting hours or even days later and posing a risk to firefighters. Utility-scale batteries would be larger than those used in electric cars, potentially as large as a shipping container. New York City wants to have 100 megawatt-hours of storage deployed by 2020 and California and Massachusetts have also set ambitious storage goals. Achieving them will mean increased deployment of batteries in densely populated residential areas. If, that is, the cities can work out appropriate safety measures. Thus far, New York City is the first municipality to wade into the issue. In April, the city’s fire and building departments, along with City University of New York, New York State Energy Research and Development Authority, and utility Con Edison published a permitting and connection guide for outdoor lithium-ion systems. The next step will be finishing a similar guide for indoor systems installed in buildings, which they hope will be finished by the end of the year. On the West Coast, the California Public Utilities Commission provides consumers with information about best practices for battery installation. The list shows that, for the moment, standards are piecemeal. Santa Clara County, California has developed a “relatively advanced” list of best practices, but these are not required by statute across the state. Alternate battery technology that doesn’t rely on lithium might reduce fire risk. Unfortunately, the market is largely settled on a single technology. According to the market research firm GTM Research, lithium-ion technology has been a market leader for 13 consecutive quarters, and GTM predicts that another 1,233 megawatt-hours of grid-connected storage will be deployed in 2018. Battery fires are particularly hazardous because they involve both electricity and potentially hazardous chemicals, including rare earth metals and noxious fumes. During a battery fire at a Hawaii wind farm in 2012, firefighters were advised not to enter the building housing the batteries because of the risk of explosions, poisonous gases, and structural collapse. The wind farm used lead acid batteries, rather than lithium-ion technology. Even so, the event shows the need to make sure that first responders are properly trained to handle battery fires in jurisdictions where storage facilities are being constructed.